A nearly flawless museum robbery, a missing million-dollar necklace, a stalled police investigation. For the victim of the crime, the situation calls for desperate measures. Penelope Fitzpatrick wasn’t born to wealth. Her grandfather fed the family by selling his small stash of gemstones smuggled from tsarist Russia when the monarchy fell. Now, Pen has done well for herself as a successful novelist. But when the final jewel in her family legacy becomes the target of a cunning band of thieves, and the priceless piece is stolen, the police have many excuses why they can’t solve the crime. Not one to accept defeat, Pen does the only thing she can do—gather a group of friends to help catch the crooks and steal back the necklace. Fans of Janet Evanovich and Jana DeLeon will love this daring and spunky group of women friends in their first mystery caper. I really enjoyed Diamonds Aren't Forever. I loved it! It was just as good as the Samantha Sweet or Charlie Parker books. Enjoyed this very much. Likeable characters, exception, of course the bad guys. Looking forward to reading more in this series. I enjoyed the plot immensely, chasing down 'Frank' with it's twist & turns. I'm a fan of spunky older women but I would never even think about doing what Pen and the others did. 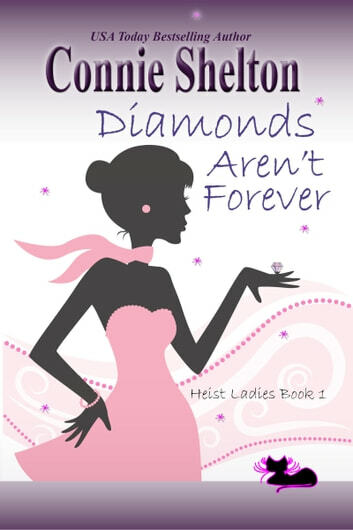 Diamonds Aren't Forever by Connie Shelton. A rather disappointing read as the story line was just too implausible to be credible. I am an ardent follower of the Charlie Parker & Samantha Sweet series so will continue to follow the Heist Ladies Mysteries to see how they develop. This story was an improvement on other Connie Shelton books I've read as it was a little more believable.